Photographer(s) Appreciation: Thank you to Christopher Young (aka c.young@Flickr) for this well-composed photo of Dermatobotrys saundersii shared via the Botany Photo of the Day Flickr Pool). Dermatobotrys saundersii, or tree jockey, has a limited distribution in coastal scarp forests of South Africa and Madagascar. Like the previous Billbergia nutans, it most often grows as an epiphyte (on other plants), though it will sometimes establish in soil. Intriguingly, it is typically epiphytic on decaying trees, often growing within the forks of trunks or branches. Woody rhizomes help to lodge and spread this plant within the decaying tissues. The upright woody stems will reach 1m in in length (2-3 ft.), as they spread upwards or laterally in a wavy manner. A highly-regarded ornamental plant by enthusiasts, it is often grown indoors. 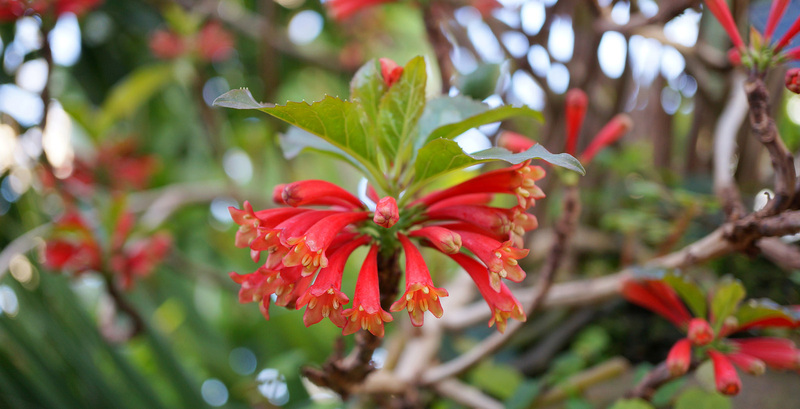 Here, the tubular red flowers can bloom at any time of the year. Where it is grown outdoors under mild conditions similar to its distribution range, it can bloom anytime from mid-winter to mid-summer. Pollination likely occurs by sunbirds primarily, who can access the nectar inside the trumpet-shaped flowers with their long bills. That noted, not enough is yet known about the ecology of this unusual species. Dermatobotrys saundersii is the sole species within the genus. The generic name is derived from the Latin words derma (skin) and botrys (bunch of grapes); this likely refers the feel of the leaves. Described as both rubbery and fleshy, the soft-textured leaves have a reddish tinge. As well, the scent of the crushed leaves is described by one seed-seller as “sort of like lemon furniture polish”–not unpleasant, just “unusual”. In natural conditions the plant is deciduous, losing its leaves in the autumn. Another possible source for the generic name is the fig-like fruits produced in small clusters, which superficially resemble grapes. Each of the fruits contains several seeds within a sweetish pulp. The specific epithet is a tribute to Sir Charles James Renault Saunders who was thought by Bolus (the taxonomist who scientifically named the species) to be the first to collect Dermatobotrys saundersii. In truth, W.T. Gerrard had collected the first samples for Western science some years before, but this was not known to Bolus at the time, nor had anyone published a scientific name for the species prior to Bolus. Interesting. With the right provenance, it might even be hardy in my unheated greenhouse here in northwest Oregon. I bet it would work nicely in a coco fiber lined hanging basket filled with orchid bark and leaf mould. The fruit take about a year to ripen and it can contain about 70+ very small seeds. Flowers and fruits can be found on the same plant. I keep my plant in a greenhouse and seed is still produced without being pollinated. It is very easy to propagated by cuttings.